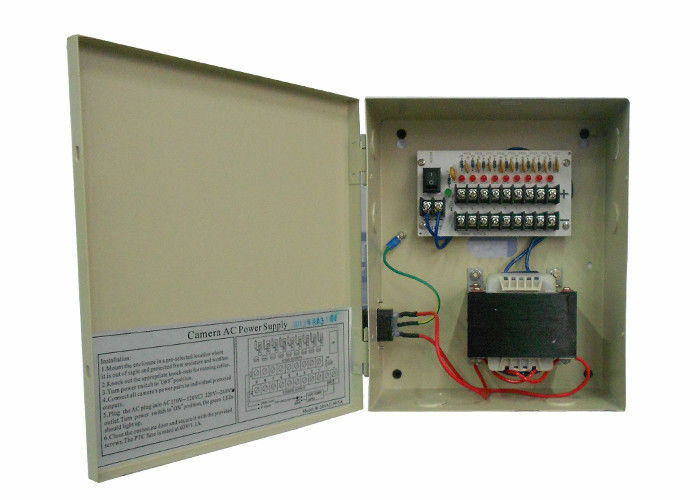 The CCTV power supply is primarily designed for WUF-GV, PTZ and camera of CCTV system. It’s also used for access, building/house control, intrude alarm and other light-current. It is for desktop or wall-mounted installation. When over current occurs, the corresponding channel output will automatically switch to self-protection status, and the other channels output will work normally. When the fault is cleared, it will switch back to normal. When short-circuit occurs, the individual PTC fuse will break the circuit. When the fault is cleared, it will switch back to normal automatically. This is one of the best 24VAC CCTV power supply boxes on the market for security cameras. We replace the cheap "glass fuse" with "PTC" Reset Fuses which will Auto Reset after you fix the short. You don't have to run around town try to find the replacement fuses. All you have to do is to fix the shorts.